Here's a fun, easy to do DIY project that is an improvement over my previous homemade apple fruit picker tool. I call this the four-pronged fruit harvester picker. That's because instead of the usual two, this fruit picker has four prongs that are almost aligned with each other. The four prongs of the fruit picker significantly increases the chances to catch fruit. It essentially doubles the area of the "catching area". This is especially useful when the fruits are on the higher branches and the prongs may be difficult to see behind all the upper foliage. At that height, it becomes a hit-or-miss proposition when attempting to pick fruits with a picker that only has two prongs. 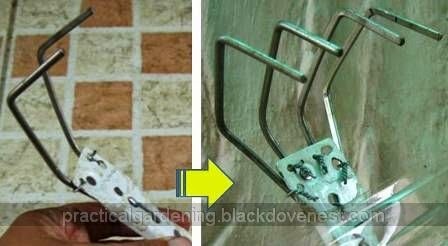 In this DIY project, two more prongs will simply be added to the existing two-pronged fruit picker harvester which was discussed in a previous article. So, from the original fruit picker shown on the left, the improved "garden rake" version of the fruit picker is shown on the right. Notice that in addition to the increased number of prongs, the angle of the prong bars has become tighter in the new version. This is to ensure the fruit doesn't easily slip out of the fruit picker's grasp. With a metal hacksaw, cut a steel rod that is 13 inches long. This steel rod will become the additional two catch prongs. Remove burrs and smoothen the ends with a flat file. Bend and form the steel rod with a metal pipe. Use directions shown in this article. The additional two catch prongs should have segments measuring 3 inches, 2 inches and 1.5 inches. With a power drill, drill 1/16" holes in strategic points on the fruit picker stem that will allow you to tie the new two catch prongs to the fruit picker stem. Tie the new catch prongs to the fruit picker stem as shown below. This is how the wires look like as seen from the front. Reattach the the new improved 4-pronged fruit picker tool to the fruit picker catching basket. Shown below is the painted fruit-picking tool, now well-worn from all the fruit pickings (mostly eggruits). Notice also that fruit sap has also spread inside the fruit picker basket. This is natural for these kind of fruits. So, occasionally, you need to clean the inside surface of the basket. Otherwise it would become blurry and more dirt and debris would stick to the smeared fruit sap. An oil or petroleum-based cleaner would remove the dried sap. Spray cleaner on the inside and wipe with a rag. Alternatively, you may dip the rag in oil and scrub the inside. You can compare the size of the fruit-picking tool in relation with the big ripe eggfruit inside. Twenty-four fruits in one fruit-picking session from a small tree!